BSR captures anything you see on the screen as video+audio and pictures. Records video to AVI, SWF, WMV, EXE formats. Any portion of the screen can be selected for recording. Records audio from microphone, speakers (what you hear), CD Audio, MIDI etc. into video. Includes everything you will need in a screen recorder. Plus inludes Movie Lab and Studio : Cut portions from video, add sound, join & split videos, change their speed, compression etc. * Auto configuration of playback speed. * Change compression options such as quality, key frame rate etc. * Hotkeys for 'Record', 'Stop', 'Pause' and 'Take Picture'. * Runs in tray or at corner. Qweas is providing links to BSR Screen Recorder 5.2.2 as a courtesy, and makes no representations regarding BSR Screen Recorder or any other applications or any information related thereto. Any questions, complaints or claims regarding this application BSR Screen Recorder 5.2.2 must be directed to the appropriate software vendor. 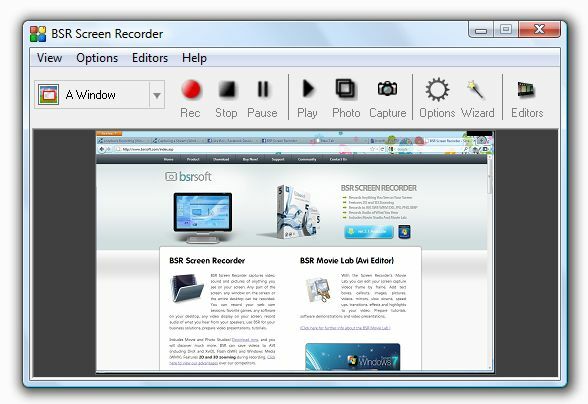 You may click the publisher link of BSR Screen Recorder on the top of this page to get more details about the vendor.